Experience your mind wandering off without you realizing it until much later on. Needing help to learn another language. Often some people find that the harder they try to concentrate, the more difficult it is to remember things and the more frustrated they become. This is where memory hypnosis comes in to help you. You improve your memory by improving your concentration. Memory hypnosis is a powerful way to help you do just that. Easily and effortlessly. Memory hypnosis is of course especially helpful to students. Many students are surprised that they can learn more material in a much lesser amount of time. Students can improve their grades by increasing the speed with which they read. At the same time they can also much improve their retention and recall of the material they have read. Go here for more information on School Success and Hypnosis. Even foreign languages are much more easily learned with the help of memory hypnosis. Not only students, but overseas travelers and business people can effectively use memory hypnosis as a very effective aid to learn another language (or two!). However people from all walks of life benefit from memory hypnosis. Watch the short video below for an example of how the police use hypnosis to improve witnesses' memories to help them with their investigations. 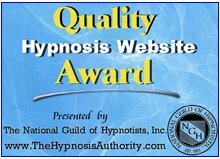 Experience hypnosis now to start you on the way to improving your memory. Just download the free Learn Self Hypnosis mp3 and try it for yourself. Fill in your name and best email address below now because you'll be ready to start right away. Ask me more about how hypnosis can help you below.